Dental implants is a also a cosmetic dentistry procedure done by the dentist in Geelong. This is done where there are no teeth in the mouth and the person has to wear a full denture which covers the palate entirely. The dental implant is offered by the dentists to the patients when patients can feel there is a loss in taste and talking changes due to a plastic denture in the mouth. Wearing a Full dentures can also be quite uncomfortable at times. As there is not enough gum to hold the dentures in its place. A loose denture can make the person to lack confidence. In this situation an existing full denture can also be modified and can be used with the insertion of two to four surgical dental implant also called all on four dental implants at a cheaper cost. Dental Implant can also be a permanent solution. The number of dental implant can vary from person to person and the crown teeth are fixed to the dental implants. Treatment planning for all teeth dental implant placement varies from person to person. Various factors need to be considered and taken care. A CT Scan is also mandatory for all dental implant treatment planning. CT Scan information is used by the dentists. A stent, similar to a stencil can also be produced and used to aid in the placement of the each dental implant. The stent will fit over the teeth or the bone surface or the gums, which has pre drilled holes to help in the position and angle of the dental implant also called flapless dental implant surgery. Dental implants placement with the use of stent may also increase the cost of dental implants. 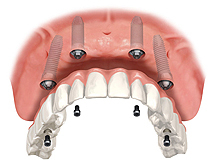 At all stages, the patient will interact in the decision making process of their dental implant. If you need any cosmetic dental implants treatments done with dentist in Geelong. Please call our cosmetic dental clinic in Geelong to book your dental implant appointments. Speak to our qualified cosmetic dentists doing affordable and cheaper dental implants in Geelong.